PERM — A medical training simulator, high-temperature 3D printer and automated geological prospecting system won their respective inventors tickets to Skolkovo’s Startup Village at the final of the Startup Tour in Perm on Wednesday. The winners of the Startup Tour in Perm. Photo: Sk.ru. 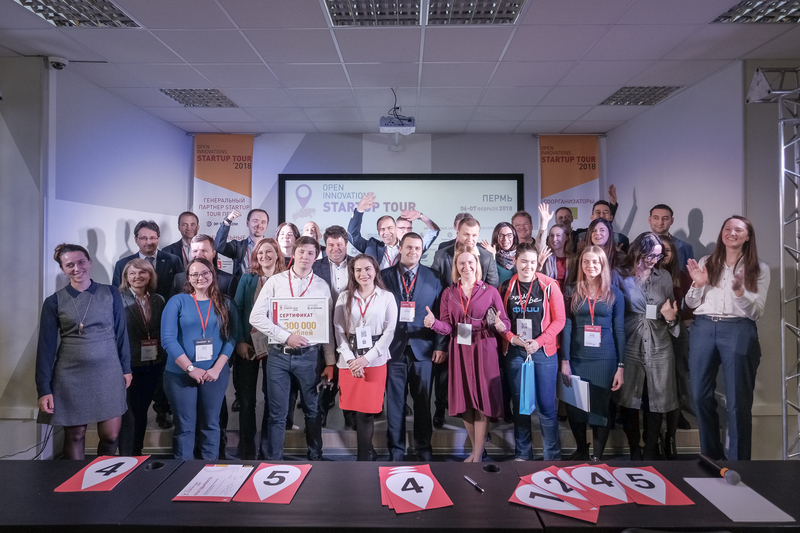 Scientists and entrepreneurs from the Perm region and surrounding cities and regions competed in three tracks at the event held at Technopark Perm: IT, biomed and industrial technologies. The winners now have the chance to present their tech innovations at the Startup Village, which is attended by thousands of investors and entrepreneurs from all over the world. The first prize in the industrial track was won by Yevgeny Matveev, with his project FDM Version 2.0, a method of 3D printing using higher temperatures. Alexander Fertman, director of science, technology and education at the Skolkovo Foundation, who was a jury member on the industrial track, said the project opened up a new market in 3D printing using FDM (fused deposition modelling). “Today, the materials we can use in 3D printing are limited: today’s printers provide a temperature of about 200 degrees, and that’s not enough to create parts from many polymers — or composites containing polymers — especially of a high quality and at a decent speed,” Fertman told Sk.ru on the sidelines of the Startup Tour. “What these guys have done is not just to increase the temperature, but also to effectively control the stream of melted polymer and ensure a high speed. It creates new possibilities for the use of polymers that have good mechanical or heat-conducting properties,” he said. Fertman expressed hope that the project would become a Skolkovo resident without delay. “Our communication with industrial enterprises has shown that there is demand for this technology, because it makes it possible not only to create prototypes in polymers, but created finished objects, which is another matter altogether,” he told Sk.ru. 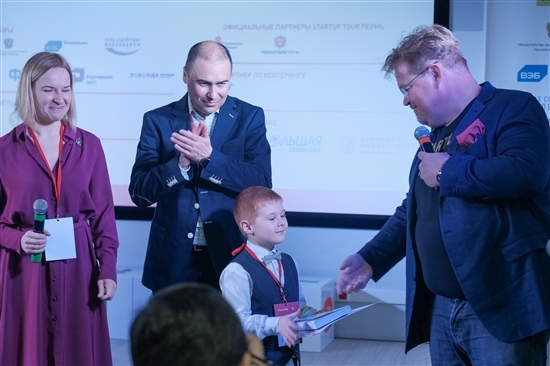 Yevgeny Matveev and his innovative 3D printer FDM version 2.0 won both the industrial track and a cash prize from the Startup Tour's general partner in Perm, local telecoms giant ER Telecom. Photo: Sk.ru. The overall level of projects presented in Perm was good, said Fertman. “Perm is an industrial region, with good engineering schools, and the projects we have seen can be applied in industry, though their business models and understanding of client requirements showed room for improvement,” he said, advising the would-be entrepreneurs to examine their potential clients' requirements more carefully. The region’s status as an industrial centre was also evident in the biomed projects, said Roman Kulikov, acceleration director within Skolkovo’s biomed cluster. “A high level of integration was visible between medics and technical specialists,” he told Sk.ru. “The engineering and IT competencies were clearly articulated, while the medicine itself was not so strong,” he said. Kulikov singled out for praise the winner of the second prize in the biomed track: a molecular-targeting fluorescent substance for making tumours visible. “The substance is introduced during operations to remove a tumour in the colon,” he said. “It makes it possible to identify the tumour — it shows up as fluorescent — and you can see all the fragments of the colon that need removing, and those that can be left intact,” he said. 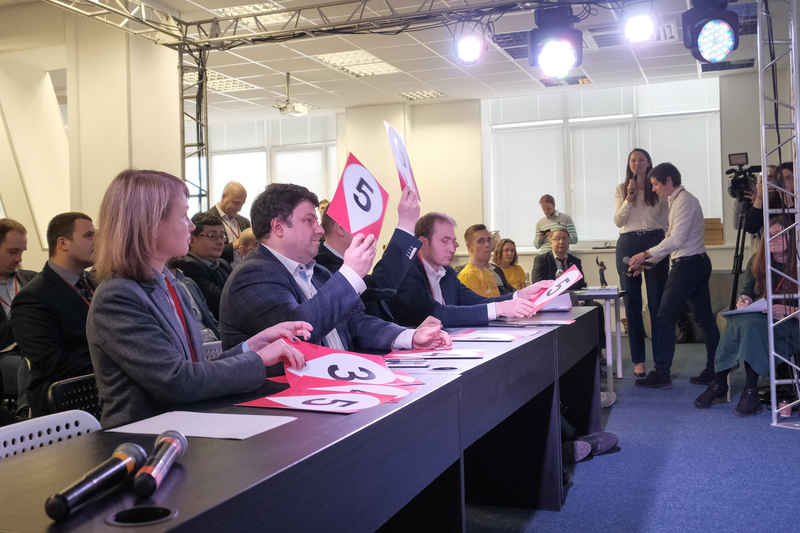 Members of the jury award points during a final pitching session to determine the winner of a cash prize of 300,000 rubles donated by ER Telecom, the event's general partner. Photo: Sk.ru. "Many of our companies gained fantastic experience in Perm from meeting with potential industrial clients, and I hope that experience will swiftly be converted into contracts and pilot projects" - Alexander Fertman. Following the awards in each track, the winners then pitched their projects again to the jury to compete for a special grand prize of 300,000 rubles ($5,244) donated by local telecoms giant ER Telecom, the Startup Tour’s general partner in Perm. That prize was won by Matveev’s FDM Version 2.0. At the start of the awards ceremony, Pekka Viljakainen, an advisor to Skolkovo Foundation president Victor Vekselberg, reminded the audience that the ultimate aim of the Startup Tour was not to find a single winner. “Whether you win or lose today, it’s doesn’t ultimately mean your project is good or bad. You still have to do the same thing tomorrow: you have to improve your project, and how you explain its value to people,” advised Viljakainen, a Finnish entrepreneur and business angel. Entrepreneurship is not a sprint, it’s a marathon, he said, encouraging all of those present to attend the Startup Village, which this year takes place on May 31-June 1. This year, the Startup Tour also includes a competition in each city for young innovators aged eight to 19. The projects in Perm included an innovative kind of cast for children and adults with broken limbs, clothing with inbuilt optical fibres to make pedestrians and cyclists more visible on roads at night, and a bracelet equipped with a polygraph that would cause a bright light to illuminate in the event of the wearer being attacked, enabling them to dazzle their assailant and — hopefully — escape. Skolkovo's Pekka Viljakainen awards a prize to Rostislav, the winner of the children's competition. Photo: Sk.ru. The Startup Tour event in Perm also included a demo day session, in which Skolkovo resident startups demonstrated their innovative tech systems and products to potential clients in industry. “The tour has been a very good experience, including in terms of cooperation with local infrastructure and local industrial enterprises,” said Fertman. “It was the first time we had held a demo day on this scale as part of the tour. Yesterday, many of our companies gained fantastic experience from meeting with potential industrial clients, and I hope that experience will swiftly be converted into contracts and pilot projects,” he said. 3rd place: Mikhail Kudrinsky with his project Identchain.